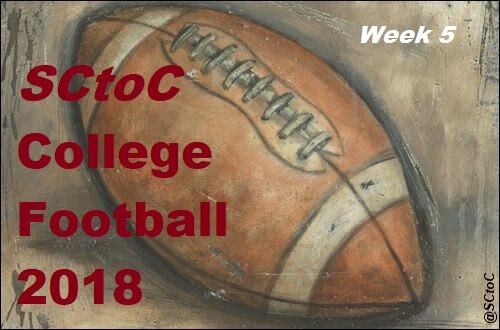 Welcome to SCtoC's week 5 coverage of the 2018 College Football Season. What: The Vikings head to neighboring Idaho to take on the Vandals. When: Saturday, September 29 at 1 p.m.
Where: Kibbie Dome; Moscow, Idaho. 2018 Records: Vikings 1-3 (0-1 Big Sky); Vandals 1-2 (0-1 Big Sky). Head Coaches (overall as HC): Vikings - Bruce Barnum (12-25); Vandals - Paul Petrino (20-43). Note(s): The Vikings gave up 323 rushing yards in their week 4 loss to Montana St. Davis Alexander completed 15 of 27 passes for 212 yards and an interception in the loss He also rushed 18 times for 71 yards and a pair of touchdowns. Mataio Talalemotu caught five passes for 69 yards and Charlie Taumoepeau had three grabs for 50 yards for the Vikings. The Vandals didn't fare much better than the Vikings last week in their 44-21 loss at UC-Davis. Mason Petrino went 23 of 41 for 284 yards with three touchdowns and an interception. Isaiah Saunders gained 102 yards on 20 carries. David Ungerer had nine receptions for 86 yards and a score, while Jeff Cotton caught five passes for 79 yards and a touchdown for the Vandals. What: They Eagles head to the Big Sky state to face the Bobcats. When: Saturday, September 29 at 1:05 p.m.
Where: Bobcat Stadium; Bozeman, Montana. 2018 Records: Eagles 3-1 (2-0); Bobcats 3-1 (1-0). Head Coaches (overall as HC): Eagles - Aaron Best (10-5); Bobcats - Jeff Choate - (11-15). Note(s): The Eagles blew off a week 3 loss to in-state rival Washington St. and came back to dominate Cal Poly last week, 70-17. Gage Gubrud hit 21 of 27 passes for 215 yards with a touchdown and a pick. Antoine Custer Jr. rushed only eight times but had 133 yards with a pair of touchdowns. Sam McPherson also had eight catches, going for 84 yards and two scores of his own. Jayson Williams led the Eagles with four receptions. The Bobcats earned their first Big SkyConference win of the season with a ferocious rushing attack in a 43-23 win over Portland /St. in week 4. Troy Anderson threw for 107 yards and a touchdown, but was more impressive on the ground by rushing 22 times for 211 yards and two scores. Isaiah Ifanse added two touchdown rushes off 19 carries for 100 yards. Kevin Kassis caught a pair of passes for 57 yards and a touchdown in the win. What: A rivalry renews as the Cardinal visit South Bend to face the Fighting Irish. When: Saturday, September 29 at 4:30 p.m.
Where: Notre Dame Stadium; South Bend, Indiana. Head Coaches (overall as HC): David Shaw (77-22); Fighting Irish - Brian Kelly (223-90-2). Note(s): The Cardinal continued their September run last week in an unlikely fashion. They found themselves down 17 points heading into halftime. The Cardinal scored, then recovered an unlikely Oregon fumble with 51 seconds remaining in Eugene. Jet Toner's 32-yard field goal as time expired threw the game into overtime, and Colby Parkinson's juggling catch, followed by Alameen Murphy's interception sealed the extra period win. 38-31. K.J. Costello went 19 of 26 for 327 yards with three touchdowns. Bryce Love gained 89 yards on 19 carries with a score. Kaden Smith caught six passes for 95 yards, while J.J. Arcega-Whiteside had four grabs for 84 yards and two touchdowns in the win. The Fighting Irish come in ranked eighth in the country (just a spot behind the Cardinal), and are looking for a National Championship bid. They are an independent, meaning they do not play in a conference. They had an easy time of it last week in a 56-27 win over Wake Forest. Ian Book tossed for 325 yards on 25 of 34 passing with a pair of touchdowns in the win. He also rushed for three scores. Jafar Armstrong gained 98 yards off just eight carries with two touchdowns. Alize Mack caught six passes for 61 yards for the Fighting Irish. What: The Ducks face their first road test of the season as they head to Berkeley to battle the Golden Bears. When: Saturday, September 29 at 7:30 p.m.
Radio Stream: Ducks - 750 The Game. Golden Bears - KGO 810. 2018 Records: Ducks - 3-1 (0-1 Pac-12); Golden Bears 3-0 (0-0 Pac-12 North). Head Coaches (overall as HC): Ducks - Mario Cristobal (29-49); Golden Bears - Justin Wilcox (8-7). Note(s): The Ducks were moments away from winning their conference opener, only to see defeat snatched away from the grips of victory. A C.J. Verdell fumble with under a minute to go and a Stanford field goal sent the gae into overtime, where the Cardinal prevailed, 38-31. The Ducks will face another formidable test as they face the upstart Bears. Justin Herbert went 26 of 33 for 346 yards with a touchdown and an interception. He completed just one of his final six passes late in the fourth quarter and in overtime. Verdell rushed 20 timds for 115 yards and a score. Dillon Mitchell had a monster receiving game, catching 14 passes for 239 yards. The Bears come in 3-0 as they come off their bye week. That's exactly where they were a year ago as they headed into their conference opener. Dating to last season, Bears head coach Justin Wilcox is 6-0 in non-conference play. The Bears will be looking for a bowl bid this season after falling just short last season with a 5-7 record. The Bears completed their non-conference schedule with a solid, 45-23 win over Idaho State in week 3. Freshman quarterback Chase Garbers completed 80 percent of his passes for 224 yards with 3 touchdowns and a pick. Marcel Dancy added a touchdown to his 80 rushing yards. Jordan Duncan led the Bears with four receptions for 63 yards and two touchdowns. Twitter: Ducks * Golden Bears. Trenton Irwin - 5 rec, 57 yds.